June 27, 28, 29 & 30, 2018. DD writes: “I first encountered the play as a drama student playing the wronged Duke of Milan. It has always been a difficult play to classify: is it a comedy. a romance or a tale of revenge? There are melancholic moments and moments of beauty all set within a magical island. This very ambiguity is what attracts me to the play and it means there is something for everyone when watching. At that time Miranda’s greeting “Oh brave new world” seemed perhaps less ironic than it does to me today – but the themes of hope and forgiveness are just as powerful. As Shakespeare’s farewell to the stage it is also very moving in showing a man ready to put down his pen after a life of creating magic. Of Gender – I have never been worried about casting against gender and you will see in the play tonight that some characters traditionally male are played by women. Of course, in Shakespeare’s day all the parts were played by men with younger actors taking female roles. The audience would have accepted Miranda and Ferdinand’s love played by two male actors without any fuss. So. I ask you to sit back and enjoy the characters just as you would have done in Shakespeare’s day …. 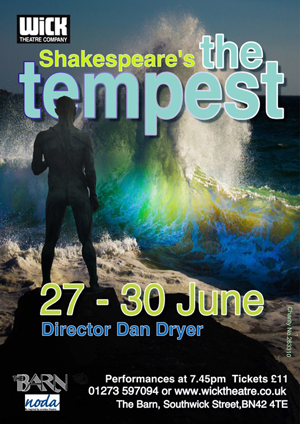 Shakespeare’s last play The Tempest has long dazzled readers and audiences alike with its intricate blend of magic, music, humour, intrigue and tenderness. Dan Dryer gets the chance to direct it for Wick Theatre Company 25 years after playing the wronged Duke of Milan, Prospero as a student. Dan’s production runs from June 27-30 at the Barn Theatre, Southwick Street, Southwick. “I am on the play selection committee, and I just felt that in the Wick we had not done a Shakespeare for a couple of years. I wanted to do The Tempest and I wanted to direct it. It is an unusual play, a strange play which is difficult to classify. In some ways it is a comedy, but it is also a romance and it is also a tale about revenge and it is also a play about magic. And that is a big part of both the fun and the challenge of directing it. “There are so many choices that you have to make and that is what means that every production is different. At the start when Prospero is recounting his story, in one sense it is a huge exposition. You are introducing everything that is going to happen in the play. But there are so many different ways of playing it. When Prospero is telling his story, you have to think whether it is revenge or anger or resentment. You have got to come to decisions about how you are going to play it, and for me the interesting thing is that the decisions I am making now as a director are different to the decisions I came to 25 years ago as an actor. This very ambiguity is what attracts me to the play and of course this means that there is something for everyone when watching. At that time Miranda’s greeting of ‘Oh brave new world’ seemed perhaps less ironic than it does to me today – but the themes of hope and forgiveness are just as powerful. As Shakespeare’s farewell to the stage it is also very moving in showing a man ready to put down his pen after a life of creating magic. “I asked my workshop whether they had a quaint device and they said they hadn’t! But the challenge is that we need to create an atmosphere of magic, a real sense of atmosphere. I am using modern music because the music would have been modern when the play was first performed. The Tempest has many layers and can be seen in many ways, just like Wick Theatre Company’s production of the Bard’s last play. Much of the performance at the Barn Theatre in Southwick on Thursday night was really very good but there were some elements that made it really rather difficult to feel fully immersed in the experience. It did not help that several minutes into the performance, two people not only arrived late, they took some time to actually sit down, creating quite a distraction. This is not Wick’s fault but at the same time, the sound of the storm raging was so loud, not all the voices could be heard, and the smoke effect so thick.it made the whole thing feel very oppressive. On the flip side, one cold say that really did put you in ‘the tempest’ but for me, it was hard to concentrate will all these distractions. Bob Ryder’s performance as Prospero, a weighty part indeed, especially at the start, was excellent, though sadly a little lost under all the chaos. In fact none of the performances could be faulted and everyone handled Shakespeare’s text really well. Even the modern music director Dan Dryer chose to use worked within the whole. One of the real highlights of the night was the comedy, mainly courtesy of Guy Steddon as the jester Trinculo and Alex Bond as the drunken butler Stephano. I was disappointed there were not more people laughing as heartily as I was, in fact. But the stand-out performance had to be Jacqueline Harper as the slave Caliban. She held her hunched-over, monster-like posture throughout each of her scenes – quite some time in some cases – and bounded around the stage with great athleticism. I especially enjoyed the drunken antics of Trinculo, Stephano and Caliban, and the way the movements of someone under the influence were portrayed spot on. Emily Hale was domineering and bold as the spirit Ariel, surprising us all at one point with giant wings. It was nice to see the return of Sophie Lane, who played Miranda as delicately as one would expect. The main scenery was a one piece rostrum-type affair which spinned and turned to become either a hilltop or cave. It was all very clever. Maggi Pierce and Cherry Fraser in wardrobe had their work cut out for them, too, creating lavish robes and silken gowns, as well as Caliban’s draping affair. Text Header : HHH – no idea what this means! THE Tempest, written late in Shakespeare’s career, takes place on a remote island where the sorcerer Prospero, deposed Duke of Milan, plots to restore his daughter Miranda to her rightful place using illusion and skilful manipulation. He conjures up a storm causing his usurping brother Antonio and the complicit King Alonso of Naples to be shipwrecked on the island. There, his machinations bring about the revelation of Antonio’s treachery, the redemption of the King, together with the marriage of Miranda to Alonso’s son, Ferdinand. Along the way the mischievous sprite, Ariel, has fun at the expense of Stephano and Trinculo, two drunkards and Caliban, a deformed creature and Prospero’s slave. Director Dan Dryer should be applauded for his straight forward production – no bizarre liberties with the script nor does he shift out of time to make it ‘relevant’. The stage was dominated by a large rock formation which moves around the stage as the location changes. The lighting and projections are effective, However there are some pockets of dimness where actors are indiscernible and there are times when audibility is lost through overly loud sound. A good performance from Bob Ryder has his Prospero being a gentle, benign man only using magic to right wrongs. Aloft his rock he looks down on Miranda and Ariel, a smiling watchful parent to both. A slight irritant is the over use of his semaphoring hands in his early speeches. Ariel and Caliban, usually male roles, are well served by Emily Hale and Jacqueline Harper whose performances soon dispel any notions against gender crossing. Sophie Lane delights as Miranda, bringing out all her innocence and honesty. Guy Steddon and Alex Bond bring Music Hall knockabout comedy to the antics of the drunken servants whilst Tony Brownings’ honest Gonzalo stands out from the rest of the royal court. An ocular performance of the Tempest. Ariel’s command of the curse was as moving as the rest of the stage dynamics. A clear presentation of peer possession of native naivety and the decisive division of mariner classes was a classic warning of the wrongdoings of invading islands of belief.